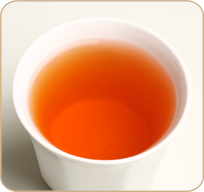 TEA BENEFIT High level of antioxidants, its lack of caffeine, and its low tannin levels. Is purported to assist with nervous tension, allergies and digestive problems. Traditional uses of rooibos include alleviating infantile colic, allergies, asthma and dermatological problems. DESCRIPTION South african red bush tea. Very healthy. Contains rooibos, cocoa bits, ginger bits and barley malt.